Square Inserts are made from Free Machining, Free Cutting, Leaded Brass, 300 Series Stainless Steel or Aluminium which are Passivated and Tested to ASTM Standard. Square Inserts are available in any metric or imperial sizes as per custom specification. Square Inserts include rounded edges that allows them to slide easily over surfaces from carpeting to concrete. Durable material can withstand harsh environments and heavy use. The Tapered Rib design works efficiently on the inside of the tube and Square Inserts to ensure a tight fit. Ribs for tight fitting and stability. Square Inserts prevent Dirt and Dust ingress. Square Inserts are designed to be inserted into hollow square tube with ribbed sides for a securing fitting to offer protection from sharp tube edges. A durable material protects against abuse from general wear and tear, grinding and rubbing against hard and rough surfaces. Square Inserts allow for the insertion of external hardware to be used in conjunction with a Square tube, pipe or box section. Square Inserts meet RoHS Requirement and UL Listed. Square Inserts have cover sharp edges and protect the exposed ends of tubes while providing a neat finish. General Range of Square Inserts are ideal for Load Bearing applications. Square Threaded Inserts are available for light, medium and heavy duty applications. Threaded Square Inserts are ideal as Square and caps for tubing. Ideal for use with Machine feet. 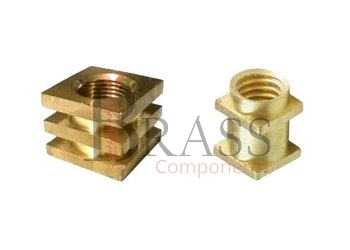 Commonly used as tube fittings for the attachment of external components. Also as fittings to connect two tubes or box sections. We manufacture Square Inserts as per Custom Specification and export in Germany, Spain, Netherlands, Portugal, UK and other European Countries. For more Information, Please Contact Us or Inquiry Now.